B cell responses are a major immune protective mechanism induced against a large variety of pathogens. Technical advances over the last decade, particularly in the isolation and characterization of B cell subsets by multicolor flow cytometry, have demonstrated the multifaceted nature of pathogen-induced B cell responses. In addition to participation by the major follicular B cell population, three B cell subsets are now recognized as key contributors to pathogen-induced host defenses: marginal zone (MZ) B cells, B-1a and B-1b cells. Each of these subsets seems to require unique activation signals and to react with distinct response patterns. Here we provide a brief review of the main developmental and functional features of these B cell subsets. Furthermore, we outline our current understanding of how each subset contributes to the humoral response to influenza virus infection and what regulates their differential responses. 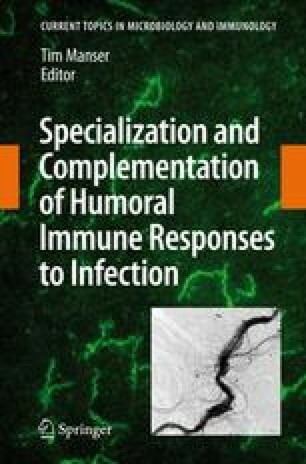 Understanding of the multilayered nature of the humoral responses to infectious agents and the complex innate immune signals that shape pathogen-specific humoral responses are likely at the heart of enhancing our ability to induce appropriate and long-lasting humoral responses for prophylaxis and therapy.